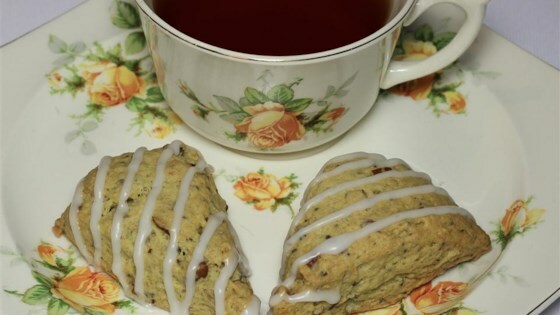 "My foray into scone variants has taken another complicated turn; loving every turn along the way though!" Preheat convection oven to 300 degrees F (150 degrees C). Line baking sheets with parchment paper. Stir orange juice and lemon juice together in a small bowl; add enough water, if necessary, to equal 7 tablespoons liquid. Stir juice mixture, coconut milk, orange zest, lemon zest, chia seeds, and vanilla extract together in a bowl; set aside until chia seeds gel, about 10 minutes. Combine flour, sugar, baking soda, ginger, cardamom, and salt in the bowl of a food processor; pulse until just-combined. Add cold coconut oil pieces and process until mixture resembles wet sand. Pour chia mixture into flour mixture; pulse until dough begins to come together. Transfer dough to a bowl and add pecans, almonds, and hemp; knead with your hands until nuts and seeds are evenly distributed. Divide dough into 2 pieces, and flatten each piece into a 1-inch thick disc. Cut each disc into 8 wedges, and places wedges on prepared baking sheets. Bake in the preheated oven until tops spring back when pressed, 30 to 35 minutes. The result was really good, but I'm way too lazy to follow a recipe with this many ingredients again.